By mattberos, March 18, 2015 at 11:54 am . In the late 90s, the visual poets Tim Gaze and Jim Leftwich coined the term asemic writing to describe a growing body of work disseminated through blogs, tumblr, flickr and print on demand. Asemic writing refers to a form of quasi-calligraphic or ideogrammatic script that emulates the act of writing but is devoid of semantic content. Gaze and Leftwich presumably drew upon the notion of asemia, a technical term from 19th century psychiatry to denote the general inability to comprehend or express signs. Asemic writing is international in scope and draws upon the fringes of concrete poetry, pre-literate scribbling, art brut, automatic writing, xenolinguistics and lettrism. The blogs New-Post Literate and asemic.net, the web-based journal Scriptjr.nl and the Future Script Gallery, an online gallery that will eventually open as a houseboat, are the main web forums that curate a sizeable body of asemic writing. The growing internet subculture of asemic writing has parallels with the interests of book artists and post-digital artists in the codex form. Jessica Pressman uses the term ‘the aesthetic of bookishness’ to describe an emergent strategy where book artists and writers draw attention back to the book form itself, in a way that speaks to our current cultural moment. Similarly much of the work produced by asemic writers foregrounds the visual qualities of writing and the materiality of language. In this sense asemic writing redirects attention to the gestural origins of writing. Vilém Flusser develops the concept of the ‘gesture of writing’, to describe the characteristic patterns of movement for producing writing. Like Friedrich Kittler in his discussion of Nietzsche in ‘Gramophone, Film, Typewriter’, Flusser makes a phenomenological distinction between the act of handwriting, inscribing a surface with a pen or stylus, from the more pianistic gesture of typing. To grasp the essence of writing, Flusser suggests, we must consider writing in its earliest forms, the half-forgotten gestures that form the primal basis of writing. Asemic writing, being empty of formal semantic content is a purely visual form of writing occasionally resembling primitive writing systems and preliterate forms of proto-writing. 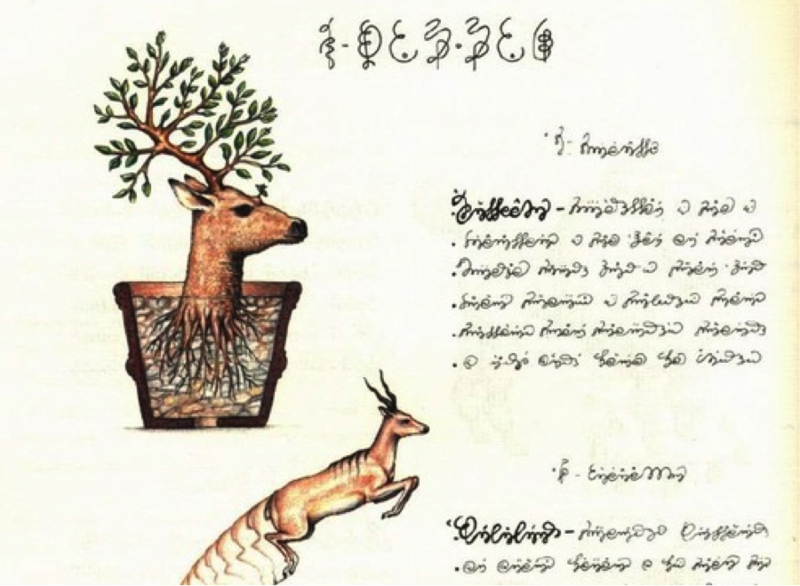 Luigi Serafini’s Codex Seraphinianus recalls the Voynich manuscript, an enigmatic 15th century manuscript handwritten in an undeciphered language, it’s cursive script is reminiscent of Sinhala and early Persian alphabets. Serafini describes his work as attempting to induce a dreamlike, pre-literate experience in the reader. A number of amateur web cryptographers have attempted to decrypt the text using character recognition and image processing filter algorithms despite Serafini already confirming the Seraphanius as a purely asemic work. One web cryptographer even put a copyright on a system that arbitrarily translates asemic glyphs into letters from the Roman alphabet. 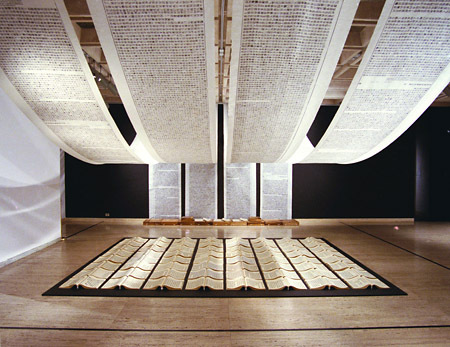 Another notable work of asemic writing is Xu Bing’s A Book from the Sky (Tiānshū) first exhibited in October 1988, in Beijing’s National Art Museum. Xu Bing spend four years inventing 4,000 illegible characters using traditional wooden movable type, a technique which was invented in the Sung Dynasty long before the Gutenberg press. To Western viewers his work bears the appearance of the traditional Chinese collectanea housed in museums, literate Chinese viewers experience slightly differs in that they are confronted with seemingly familiar but strangely illegible variants of Kangxi radicals. Asemic writers draw upon the history of writing, not in order to retreat into a nostalgic fetishization of pre-digital writing but as an aesthetic strategy that addresses our current cultural moment. 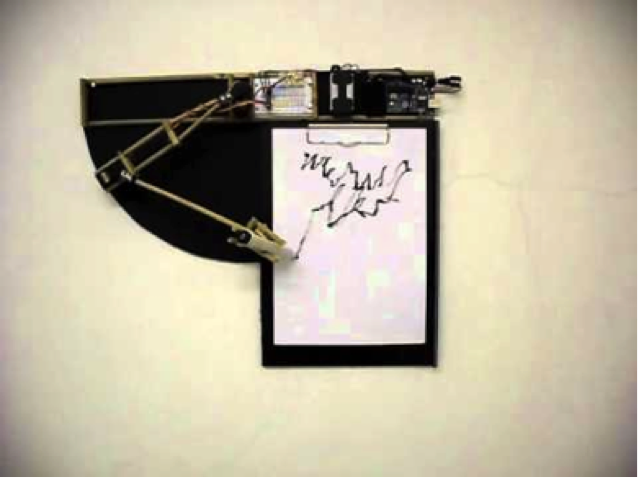 Michael Jacobson’s blog frames asemic writing in the context of McLuhan’s notion of ‘post-literacy’, i.e. a society where people can read and write to some extent, but where the literate sensibility no longer occupies a central position and the word is being replaced by the icon and rebus. The dominance of the image and the medium of the screen will have profound effects on the act of writing which, in turn will affect cognitive, cultural and bodily engagements with the world and knowledge. If, as Flusser notes, writing is a phenomena obscured by habit, then the practice of asemic writing is a method of rendering the writing act unfamiliar in a way that engages viewers with the gestural origins of writing and raises questions about its future in our networked society.